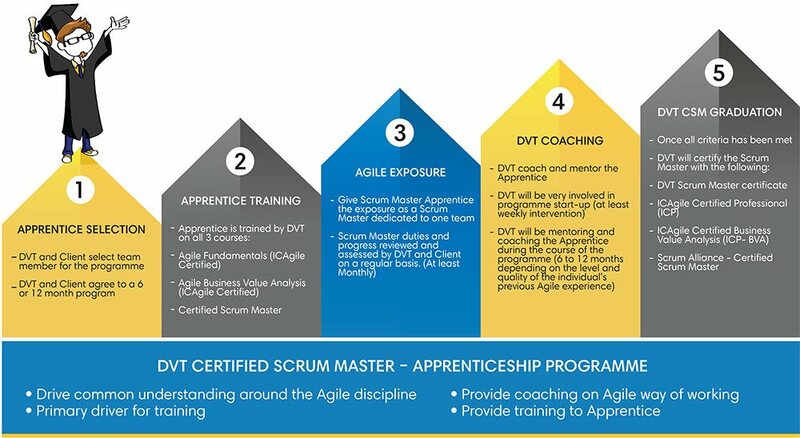 DVT's Certified Scrum Master apprenticeship programme enables professionals to fast track their role change from various professions into an efficient, certified Scrum master in an Agile team. DVT provides Scrum Master coaching training on a weekly basis to equip the individual with the knowledge required to become a Scrum master. Coaching is more intense the first 6 months of the programme where the relevant Agile ceremonies are set up and the apprentice is taught the tricks of the trade by an Agile coach with years of experience as a Scrum Master. During the programme, the apprentice is in the role of a Scrum Master with one or two Agile teams assigned. This ensures on the job training with actual experience for a period of 12 months as part of the training. DVT's expert coaches monitor, guide and assist the apprentice with practical project experience within the relevant client environment. "Great opportunity to grow your career as a Scrum Master." "Best way to learn is to be thrown into the deep end. I was exposed to a lot, learned a lot and gained valuable knowledge and a lot of experience as part of the programme"